Want to know the secrets to a great Smoky Mountain fishing trip? Smokies Angling Adventures' guided fishing tours in the Smoky Mountains offer a chance to enjoy the knowledge of your expert guide to make your fishing excursion a success. So pack up your rod and stock your tackle box to enjoy some quality time out on the water. Captain David Berry and his guides bring over 25 years of East Tennessee fishing experience to the table for whichever fishing tour your choose. Their knowledge of the lakes and waterways of the Smoky Mountain area allows you to make the most of your day on the water as they will gladly lead you to some of the best spots to provide you with a great opportunity to catch fish. Captain David Berry is an accomplished angler with plenty of awards and wins from tournaments throughout the South and has landed several bass in the 5lb-8lb range. Why choose a guided tour over venturing out on your own? It comes down to efficiency - every fisherman wants a day full of good catches. All of Smokies Angling Adventures lake trips are guided by a profession United States Coast Guard licensed guide. Your tour will take place on a fully rigged bass boat, or pontoon boat. Fishermen can bring their favorite rod or choose to let their guide equip them with a quality rod, reels, bait, and tackle. Safety is also a priority for your guides who are trained in First Aid and CPR. To prepare for your day of Smoky Mountain fishing, vacationers may want to bring food and drinks, rain suits (if needed), and, of course, a camera to take pictures of your catch and the scenic views of the rolling hills of the Great Smoky Mountains that surround you on your tour. Additionally, travelers needing a fishing license for their trip can purchase them upon arrival in town from a local agent, or on-line at www.smokiesangling.com under licensing info. 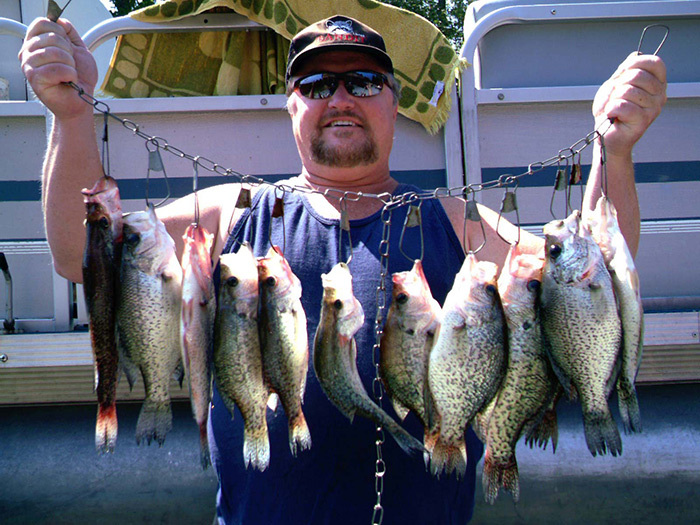 Lake Douglas - Fishers here will find smallmouth, largemouth, crappie, bluegill, and walleye. Douglas Lake stretches for 43 scenic miles and boasts 30,400 acres of surface water and 555 miles of shoreline. Douglas is rated within the top 5 Crappie lakes in the nation, and made the list as one of the Bassmasters 100 Top Bass Lakes. Douglas Lake also offers breathtaking views and plenty of fish in every season..
Cherokee Lake-A great location for catching smallmouth and striper this TVA Reservoir lies just east of Knoxville near Jefferson City and Morristown. There's plenty of fishing opportunity on this lake that boasts 30,300 surface acres of water and 463 miles of shoreline. The best fishing on this lake is usually found from October through May. Come experience the thrill of having your line stretched by Stripers or Smallmouth with the beauty of the Smokies as your backdrop. Lake Norris - Another great location for the smallmouth enthusiast, some of the best fishing can be found on this lake from October thru May as well. Norris Lake is about an hour’s drive from the Pigeon Forge area, and provides anglers with a great opportunity to catch some trophy Smallmouth. Great Smoky Mountain Spin and Fly Fishing - If trout is what you're after, the natural park boasts Appalachian Brook Trout, Brown Trout, and Wild Rainbow Trout. Smokies Angling Adventures offers Smoky Mountain trout fishing trips all throughout the year, allowing you to experience the richness of these mountain streams. Kids are welcome to come enjoy the mountain fishing experience as well. These fly fishing Smoky Mountain guides will show you some of the peaceful, scenic opportunities to enjoy nature. Because of this, all tours inside the Smoky Mountain National Park are catch and release in order to preserve this scenic beauty for other fisherman to enjoy. However: Smokies Angling Adventures also offers trips for anglers that would like to keep some of their catch as well. These trips are provided on beautiful mountain streams lying just outside of the National Park, and the guides will gladly clean your catch for you when your trip is completed. And if you are not into fly fishing. That is not a problem, you can also experience the same great trips while using spinning or spin casting equipment as well. No matter which tour appeals to you, Smokies Angling Adventures' guided fishing in the Smoky Mountains gives visitors a chance to reconnect with the peace of nature out of the water East Tennessee's lakes and mountain streams. Your guide's expertise and knowledge will only make your fishing trip in the Smokies that much more memorable. Guests staying in Sevierville lodgings will find that they are conveniently close to many of the lakes that feature tours. Make sure to pack your fishing gear for an outdoor adventure to remember on your Smoky Mountain vacation.